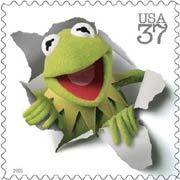 Muppet fans will be pleased to see the gang honored on U.S. commemorative stamps in 2005. "U.S. commemorative stamps portray individuals, subjects and events that are instrumental to the American experience," said David Failor, executive director of stamp services for the Postal Service. ...Among those appearing in the set are, of course, Miss Piggy, as well as Statler and Waldorf, the Swedish Chef and Dr. Bunson Honeydew and his assistant Beaker. Beloved as they are, Kermit and friends aren't the first puppets to make it on stamps, Charlie McCarthy managed the feat in 1991, along with his assistant Edgar Bergen. For a list of the other new stamps planned visit the USAToday article. On the more serious side, the stamp program will be recalling the Civil Rights Movement. A 10-stamp set honors the courage and efforts of those who took part in that effort with stamps recalling President Truman's order integrating the military, the 1965 Selma to Montgomery march, sit-ins at "white only" lunch counters and the first black students to attend Central High School in Little Rock. A wonderful children's book-tie in to this topic is Through My Eyes by Ruby Bridges , 1999. Bridges relates a moving account of her first grade year on the front lines of America's battle for civil rights. This is an important and beautiful story of courage and faith. It should be shared in every family. In addition to that set, singer Marian Anderson will be honored in the Black Heritage stamp series and tennis star and humanitarian Arthur Ashe will be recalled. Do not miss When Marian Sang: The True Recital of Marian Anderson by Pam Munoz Ryan, Brian Selznick, 2002.